1920-2014. 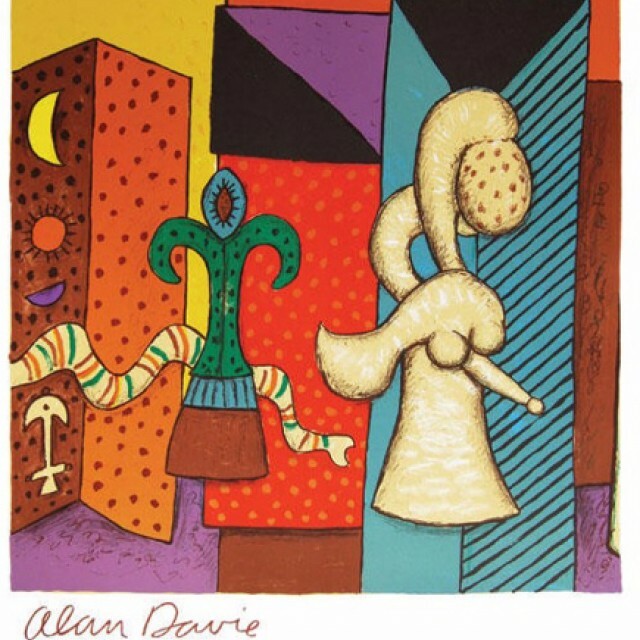 Scottish painter and printmaker. He trained as a painter at Edinburgh College of Art, initially favouring poetic imagery and coming into contact with modernism at exhibitions held in London of works by Picasso and Paul Klee. He explored a diverse range of activities, however, before returning to painting. He taught at the Central School of Arts and Crafts, London, where he became interested in African and Pacific art. As early as 1958 Davie emphasised the importance in his work of intuition, as expressed in the form of enigmatic signs. During the 1960s, both in paintings and in coloured lithographs, he represented such images with increasing clarity at the expense of gestural handling. In 1971 he made his first visit to the island of St Lucia, where he began to spend half of each year and which brought Caribbean influences to bear on his suggestive imagery. He created a synthesis of mythologies from a variety of cultures for a modern civilisation. His work is held in various private and public collections.